Regardless of life experience, mistakes on your senior tour are bound to happen when traveling because you are out of your comfort zone and region of familiarity. However, knowledge and awareness of the destination and your surroundings can be the keys to avoiding major mistakes when traveling. 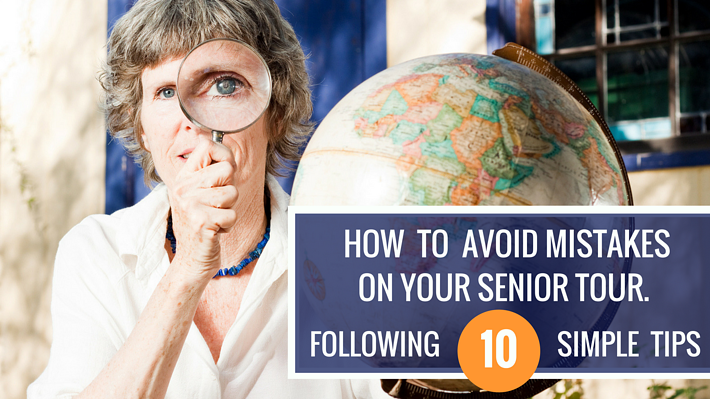 Below is a list of 10 ways to avoid mistakes for active senior travelers. And although some of them may seem obvious, it’s relatively easy to overlook or simply forget about some of these precautions. It’s always important to make sure that you are surrounded with like-minded people when traveling; with this being said, you should choose a tour that you feel will move at the pace you would like to move at. If you are on a tour that is moving a bit too quickly/slowly, you may not enjoy your time as much as you would have hoped to. This is an issue that can affect people of all ages, whether you’re in your mid 20’s, or an active senior. It is a known fact that your immune system and body are more susceptible to fatigue and illness when traveling, so it is important to give yourself some rest and relaxation when you feel that you need it. You should always keep in mind that a vacation is meant to be a new, exciting, and relaxing experience, so, if you feel that you are a bit fatigued, it’s perfectly fine to take that afternoon off! Many tour companies, tourist sites, and transportation providers will offer senior citizen discounts; and although it may not seem like much at first, 5% here and 10% there can add up very quickly, and could potentially add up to an extra nights stay on your vacation! Just be sure to ask; the worst that can happen is that there are no discounts available at that time. 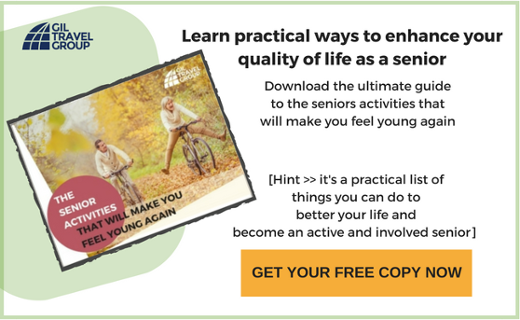 Tour groups are a fantastic way for active seniors to travel because most of the planning stage is completed for the traveler; however, it is important to be familiar with your destination. Were you aware of some of the cultural differences that you could run into while traveling? Or that the weather isn’t as pleasant year-round as it seems in the brochure? 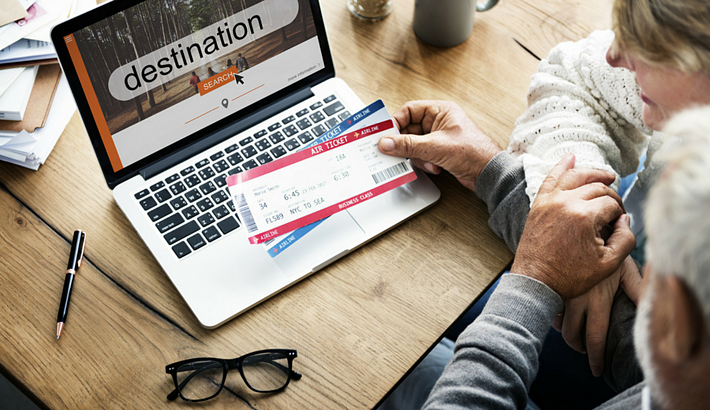 Be sure to do a bit of research before you choose your tour, and ask your travel planner any and all questions to avoid any potential mistakes on your senior tour. And once you’re on your tour, another key is to be aware of your surroundings, and embrace some of the cultural differences. It will make the experience that much more memorable. Let’s say there is something on the itinerary that doesn’t peak your interest; or rather, there is something else that you would prefer to do, that is not listed on the itinerary. It’s perfectly acceptable to deviate from the itinerary! This is your trip, and you should make the most of it by seeing what you want to see. If you’ve just retired and are taking the trip that you’ve always dreamed of, make sure that you are doing and seeing everything you want to cover. You’ve earned it! It’s no easy challenge to explore the highlights of another country in just two weeks; so, if you feel that you need a few extra days to see that one last tourist destination, take them! Although it may not seem like they would make a substantial difference, optional upgrades on tour packages can provide new and exciting experiences that you would not have had otherwise! Moreover, if you don’t think that you’ll take the same tour twice, you should go all out if you have the time and means! Conversely, you should save money where you can, so that you will be able to get the most bang for your buck. If you feel that a hotel upgrade doesn’t mean as much to you as an extra night at your destination does, then you should skip the upgrade and book another night! Whether travelling solo or with a tour group, you should always be prepared for itinerary changes. Often, the changes that occur are outside of the tour company’s realm of control. But rest assured that your tour provider has exciting, alternative options ready in the event of a deviation. Ask the questions you don’t want to ask! As cliché as it sounds, the only dumb question is the question not asked. It’s perfectly normal to have an extensive list of questions about your upcoming trip, especially if you’re just beginning your travels. But as I mentioned earlier, you should be as aware as possible of your destination, so that you know what to expect upon arrival. So, go ahead and ask your travel planner whatever question pops into your mind! As a traveler, you are putting yourself out of your comfort zone, which leads you to wonderful and exciting experiences! And by putting yourself outside of your comfort zone, you open yourself up to possibility of making mistakes on your senior tour. It’s very natural to make mistakes early on in your travels, and you should take each mistake as a learning experience, and not a deterrent. Here is a list of some positive mentalities that you should keep while traveling, as well as some more advice if you are a first-time traveler. So, while you are traveling, be prepared for the unexpected, and be sure to make the most of your time!